Moody’sA slide from Moody’s most recent credit rating report for the UK. 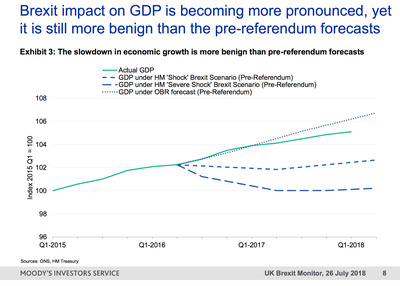 The credit ratings agency’s chart shows actual GDP vs pre-referendum predictions. Doomsday hasn’t shown up … yet. 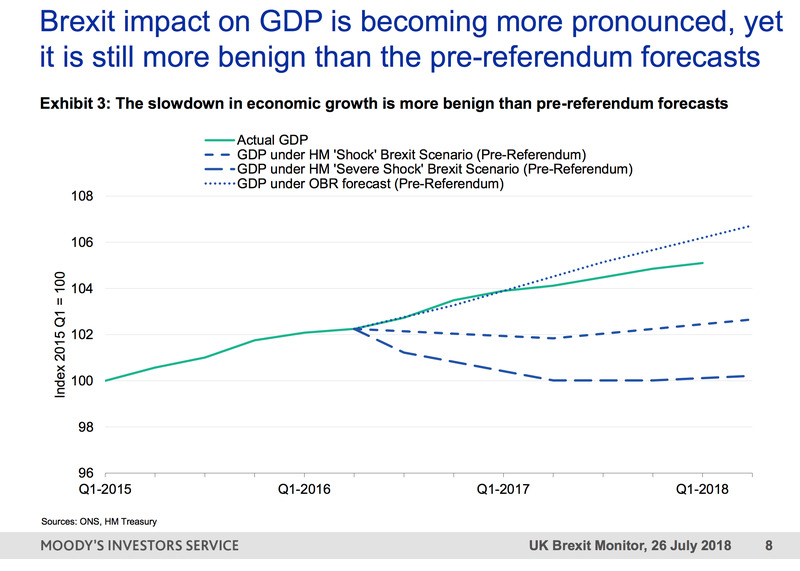 The chart – which shows UK GDP indexed back to 2015 – features actual GDP growth in green, alongside pre-EU referendum forecasts from the Office for Budget Responsibility and Her Majesty’s Treasury. Actual GDP is only one point away from the pre-vote forecast; but the OBR and HMT forecasts are far wide of the mark. The chart will be greeted with cheer by Leavers, who believe that the government and the media are conducting a “Project Fear” campaign against Brexit by suggesting that leaving the EU will wreak economic havoc on Britain. As evidence, they cite Bank of England Governor Mark Carney’s belief that the risk of a no-deal Brexit was “uncomfortably high.” His remarks have helped drive the pound below USD$1.30 for the first time in about a year. Moody’s said that while the UK’s progress has been surprisingly strong so far, the full effects of Brexit have yet to kick in. “Business activity appears to be weakening alongside recent deterioration in consumption indicators,” its presentation said.